Range of cylindrical cased axial flow fans fitted with aluminium impellers and manufactured from high grade rolled galvanised steel and protected against corrosion by cataforesis primer and black polyester paint finish. All models are supplied with pre-wired wiring junction box located on the outside of the fan casing for easy wiring access. Single phase motor (TCBB) or three phase motor (TCBT). 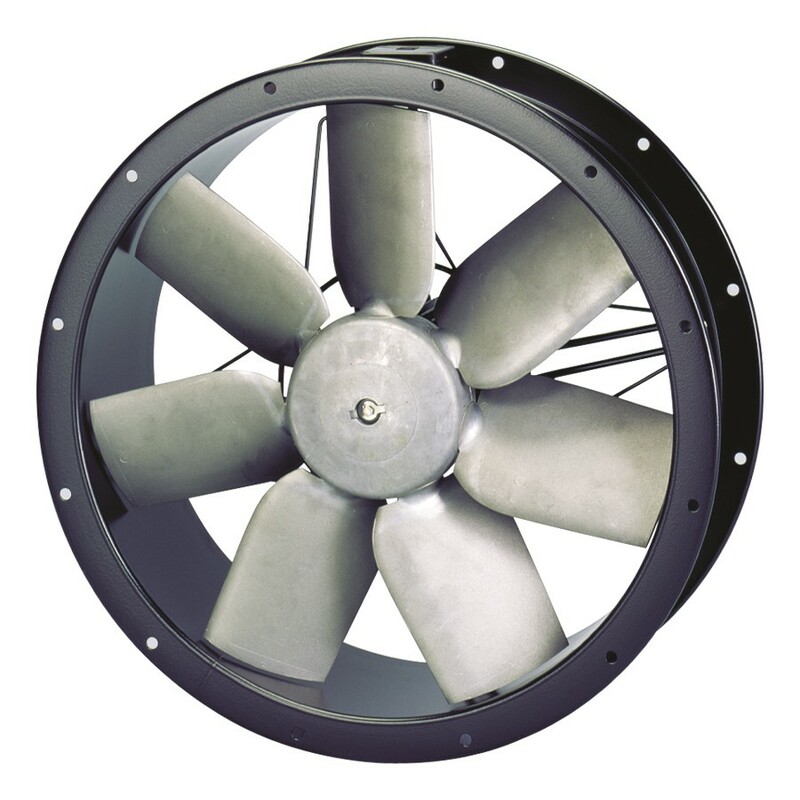 Models 250, 315, 355 and 400: External rotor motor, IP44, Class F, thermal protection, working temperature from -40�C to +40�C. 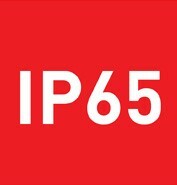 Models 450, 500, 560, 630 and 6/710: IP65, Class F, thermal protection, working temperature from -40�C to +70�C. Models 4/710 and 800: IP55, Class F, working temperature from -40�C to +40�C. All motors are speed controllable by autotransformer except models /4-560H, /4-630, 710 and T/800. Three phase motors are speed controllable by inverter. (Capacitor located inside the wiring terminal box). Three phase 230/400V-50Hz or 400V-50Hz. Air direction: form (A) configuration (motor over impeller). From �450 to �800, three phase motors 2 speed, 4/8 poles. Available for TCBT/6-400/H 230/400V-50Hz and larger sizes. 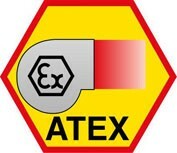 To select TCBT ATEX refer to performance curves, or Easyvent. Rolled steel casings and motor support protected by cataforesis primer and black polyester paint finish. 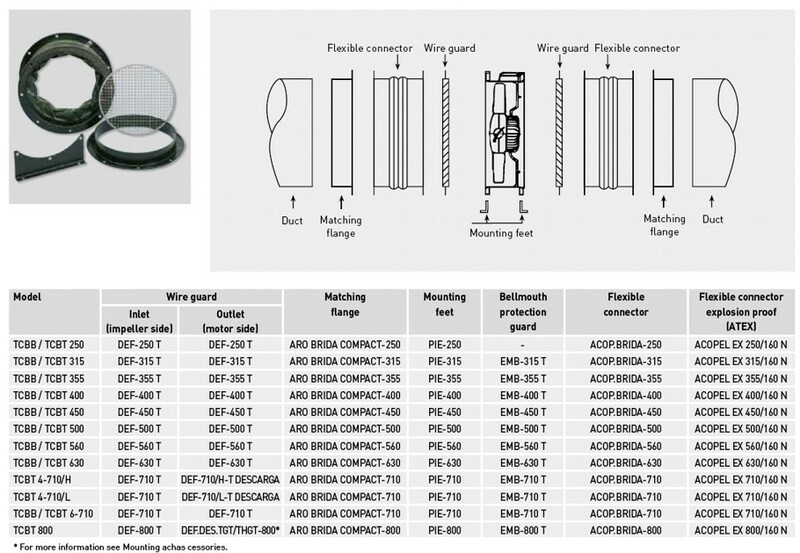 Wiring terminal box with cable gland PG-11 (except ATEX models). Impellers are dynamically balanced, according to ISO 1940 standard, giving vibration free operation. Configuration for models /4-710 and 800. 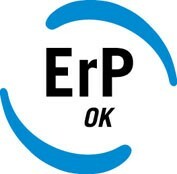 Constructive configuration models 250, 315, 355 and 400.
excepted 6-355, 6-400 and ATEX).